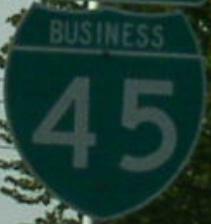 Business Loop Interstate 45 runs north-south through Corsicana. BUSN Loop I-45 passs thorugh the following town in Navarro County. BUSN Loop I-45 is not multi-plexed in Navarro County. BUSN Loop I-45 intersects the following highways in Mavarro County. U.S. Rt. 287, at Corsicana. Texas State Route 31, at Corsicana.